Apple has developed a training program to instruct employees on how to handle cars being used to test its autonomous driving software platform, according to documents obtained by Business Insider. 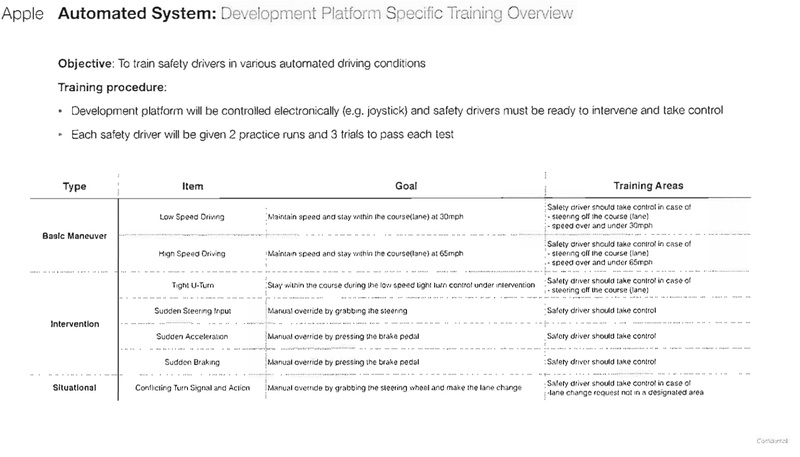 The company’s “Development Platform Specific Training” document references an “Apple Automated System” and a “Development platform,” alluding to the self-driving software platform Apple is rumored to be building after plans for a full autonomous electric vehicle fell through. Apple recently obtained a permit from the California DMV that will allow it to test self-driving vehicles on public roads, and as part of that process, the company appears to be training employees to use whatever system it’s testing. According to the DMV, Apple plans to use three 2015 Lexus RX450h SUVs, which will be driven by six drivers with expertise in areas like machine learning. Based on the documents, drivers are required to pass seven tests as part of their training before being allowed to work with Apple’s software platform. Each driver must complete two practice runs and three trials to pass tests, which cover topics like taking control of the vehicle at tight U-turns, sudden acceleration, sudden braking, and more. 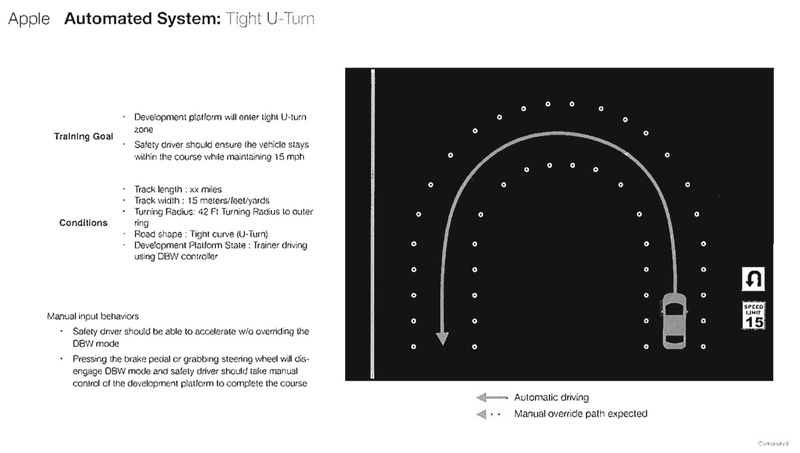 According to the training packet, Apple’s self-driving car uses a Logitech wheel and pedals to actuate drive by wire, and it supports one person at a time. Pressing the brake pedal or grabbing the steering wheel in Apple’s test vehicles will disengage the electronic driving mode, but drivers can accelerate without overriding the “drive by wire” mode. Apple’s work in the car industry has been something of an open secret for the past three years. The company was originally planning to create its own autonomous vehicle, but pivoted to an autonomous driving software platform following internal strife and leadership issues. Apple is now said to be creating a driving system under the leadership of Bob Mansfield, with the car team having been given until the end of this year to prove the feasibility of a self-driving car platform. Such a system could potentially allow Apple to partner with car manufacturers as a sort of expansion of CarPlay. With Apple ready to test the software on public roads, it appears development is fairly far along. Should the company take vehicles out on California streets, its work will need to be publicly shared with the DMV based on California law. Original article title: Apple Autonomous Driving Training Program Confirms Self-Driving Software Platform. This full article can be read at: Apple Autonomous Driving Training Program Confirms Self-Driving Software Platform.